This handbook is the third volume in a series of volumes devoted to self contained and up-to-date surveys in the tehory of ordinary differential equations, written by leading researchers in the area. All contributors have made an additional effort to achieve readability for mathematicians and scientists from other related fields so that the chapters have been made accessible to a wide audience. These ideas faithfully reflect the spirit of this multi-volume and hopefully it becomes a very useful tool for reseach, learing and teaching. 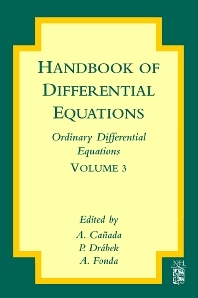 This volumes consists of seven chapters covering a variety of problems in ordinary differential equations. Both pure mathematical research and real word applications are reflected by the contributions to this volume. University of West Bohemia, Pilsen, Czech Republic.